2 min Video: Ivy sharing her thoughts on what Yin Yoga Practise really is. Have you been wanting to try Yin Yoga but not sure what it is? Have you been to a Yin Yoga Class and confused about what is the purpose of this practice? Have you been to a Yin Yoga Class and have never returned? Are you tired, over-stimulated, have sore muscles or joints, or recovering form injuries? Perhaps it is time you try Yin Yoga! So what really is Yin Yoga and why you should consider incorporating this practice as part of your yoga journey? Yin yoga is based on the Taoist concept of yin and yang chi, the cooling and heated energetic principles in nature. Yin is consider as stable, unmoving, restorative; yang is the active, changing, dynamic. Our structural body are supported by relatively stiff connective tissues (tendons, ligaments, fascia) which are referred to as yin, while the more mobile and pliable muscles and blood are referred to as yang. 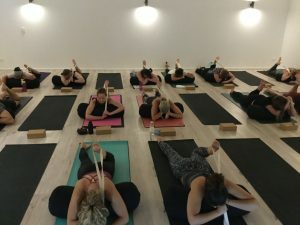 During a Yin yoga class, you’ll experience a series of long-held, passive floor poses that mainly work the lower part of the body – the hips, pelvis, inner thighs, lower spine. These areas are especially rich in connective tissues. There are areas around our upper body that are sometimes focussed on which are around our shoulders, mid and upper spine. Yin poses are held between 2 to five minutes, sometimes longer. While you’re holding these postures, your body slowly releases the need for exertion and focusses on restoring and recovering your muscles and joints, working deeper to release tensions in the connective tissues. Yin yoga is for you if you are tired and craving energy or you’re over-stimulated and have too much energy; if your mind is overactive or your energy levels erratic. Any kind of dynamic form of yoga caters to this aspect of keeping ourselves busy. Although the mind may calm down as a result of the active exercise, we are still feeding the part of us that craves intensity and wants to be stimulated, therefore overstimulating our nervous systems. If you gently stretch connective tissue by holding a yin pose for a long time in this way, the body will respond by making it a little longer and stronger – which is exactly what you want to support our muscles and joints. Yin yoga poses helps stimulate and remove blockages in the Myofascial Meridians within our body and therefore helps balance the body’s internal organs and systems. Anything you may have suppress while being on the go and busy in your daily lives will now be given the time and space to surface. This is an important step to allow our mind to clear unwanted thoughts and emotions through first acknowledging them. You learn to observe only the pure physical sensations of emotions, without getting caught up in the stories about those emotions, therefore, clearing your mind of these often unconscious emotions, giving your system an opportunity to work through the blockages they have caused in the body. Finding stillness in your body, acknowledging emotions that may have arise and clearing your mind of unwanted thoughts, are all things you will learn and experience during a Yin Yoga class. Click here to find out our schedules for your next Yin Yoga Practice here at Liquid Room. Yin Yoga Classes are available Wednesday 7:45pm, Thursday 9:30am, Friday 6:30pm, and Saturday 5:15pm.